Daikon is is root vegetable said to have originated in the Mediterranean and brought to China for cultivation around 500 B.C. 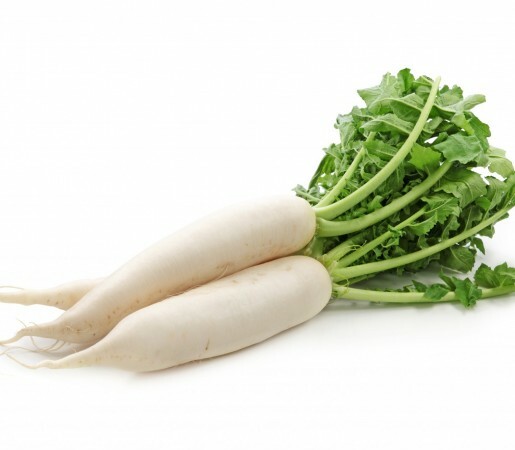 Most of the commonly available Chinese radishes are white, but some are yellowish, green or black. This is an extremely versatile vegetable that can be eaten raw in salads or cut into strips or chips for relish trays. It also can be stir-fried, grilled, baked, boiled or broiled. Use the daikon as you would a radish. Daikon also is used in soups and simmered dishes. To prepare, peel skin as you would a carrot and cut for whatever style your recipe idea calls for. Not only is the root eaten, but the leaves also are rich in vitamin C, beta carotene, calcium, and iron, so they are worth using instead of discarding. Daikon is very low in calories. A 3-ounce serving contains only 18 calories and provides 34 percent of the RDA for vitamin C. Rich in vitamin C, daikon contains active enzymes that aid digestion, particularly of starchy foods. Select those that feel heavy and have lustrous skin and fresh leaves.